708 Taggart Drive Cheyenne WY Coming Soon! Are you moving to Cheyenne WY? Check out 708 Taggart Drive! This home is located in the JL Ranch subdivison right off I-80. It will be live on the market August 1, 2018. You’ll find four bedrooms and three bathrooms with a two car attached garage! This is a perfect home for a first time home buyer. It is listed by Cheyenne WY Realtor, Eileen Sivley. This great ranch style home has three bedrooms on the main floor including the master suite with a jetted tub, main floor laundry, beautiful kitchen cabinets and pantry with easy care laminate in the living room, dining room and kitchen. Downstairs has a 10 speaker with two sub woofer surround sound that stays in the home for the new owner! This will definitely enhance your movie watching and the bar area makes entertaining easy. you can store your wine in the 4 X 9 wine room. The downstairs bathroom is 10 X 17 with a 8 X 8 walk in shower, large bedroom and walk in closet. Lots of storage areas throughout the house. Backyard is fenced and no homes behind you, just open field to watch the sunset from your patio. You’ll love this quiet neighborhood with a fenced backyard that backs up to an open field, no homes behind you, easy freeway access, and close to shopping! Similar properties for sale in JL Ranch include 5420 Liz Ranch Road and same floor plan at 5424 Alex Ranch Road. 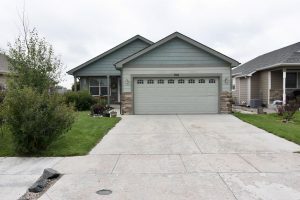 Connect with Eileen today to schedule your own viewing 307-635-0303 or online! Eileen specializes in residential sales, new construction, townhomes, land and commercial properties. You can count on Eileen to work for you!